I LOVE pears! I love them raw, in salads, on a cheese board and don't even get me started on pear sorbet!! 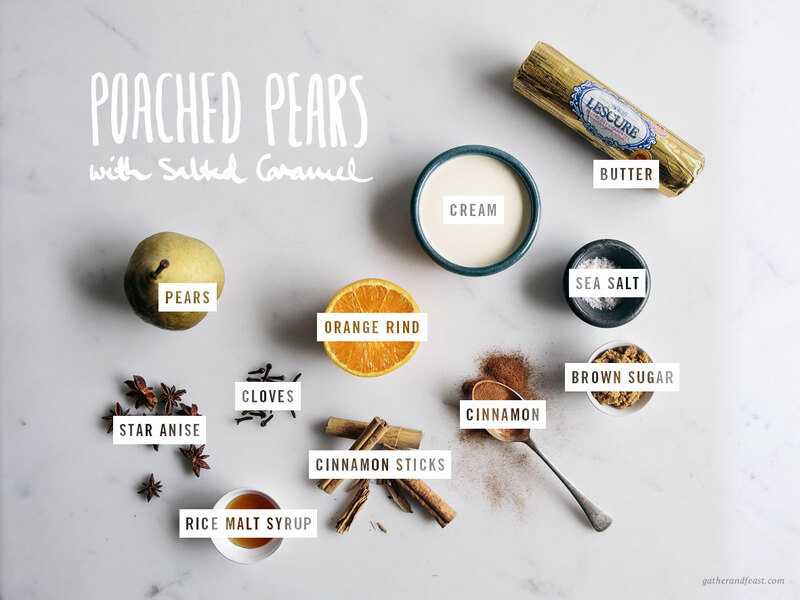 One of my favourite things to do with pears is poach them with lots of lovely spices and orange peel. I will often prepare these poached pears for breakfast and pair them up with my ‘Super Seed Granola’ (which can be found in my free recipe eBook "Morning, Noon & Night"). I also love them for dessert served with this salted caramel and natural yoghurt. This salted caramel sauce recipe is so versatile. It can be used in a variety of dishes, from these spiced poached pears, on ice-cream and inside cakes. The possibilities are endless! When making the caramel I often swap out the cream for natural greek yoghurt as it gives the caramel a lovely tartness. This dish is a combination of two very simple recipes, but the combo is seriously heaven. I have also just posted a Vegan Coconut Salted Caramel recipe if you’re after a healthier alternative. It is AMAZING!! Add the cinnamon sticks, star anise (leave out for the dessert pears), ground cinnamon, rice malt syrup or honey and orange rind into the boiling water. Peel the pears and pop them in the pot. I like to leave some whole and cut some in half, then use a melon baller to take out the core of the halved pears. Bring the pears back up to a simmer. At this point, if you stir the spiced water, you might find it is a bit slimey... dont freak out, it sometimes does this. If it is worrying you, add some extra boiling water and it should thin out. Now leave the pears to simmer for 1½ - 2 hours with the lid on, but tilted. I often like to leave the pears in the pot overnight to soak in all the lovely spices. If you are storing the pears, store them in a container in the fridge with some of the juices. Add the butter, brown sugar and cream (or yoghurt if using) into a medium sized saucepan. Stir until the butter melts and all ingredients are incorporated. Bring to the boil and simmer for about 15-20 minutes* or until the caramel coats the back of the spoon. Take the caramel off the heat and stir the salt through. Lastly, pour the caramel over the poached pears and serve with natural yoghurt. * If you’re using greek yoghurt in place of the cream the caramel should only take about 5-10 minutes to thicken up.